While weed is now legal for recreational use in many states, establishments are still allowed to perform drug tests. Common examples would be companies inspecting the efficiency of their staff, government agencies examining applicants before issuing a license or ID, or a recruiter screening candidates for employment. Though you won’t go to jail, you may lose your job, or a job offer, if you fail. Thus, it’s important to be sober and detoxify before a drug test. The best way to do this is by using a detox kit. These purge chemicals, including THC and CBD, from your body, removing any toxic trace from your bloodstream. Depending on the level of toxin exposure in your body, detoxifying may last several days. There are THC detox kits from Testclear that can hasten that process if you sense a drug test coming up. The type of drug test will also determine how long you need to detox so you won’t get a THC positive result. Drug tests commonly take samples of your saliva, your urine, or your hair. A saliva test will only detect THC content if cannabis was used within 1–12 hours. Urine has a varying timeframe of two hours to more than thirty days, depending on how frequent you consume the substance. Lastly, hair tests can single out THC within 7–90 days. 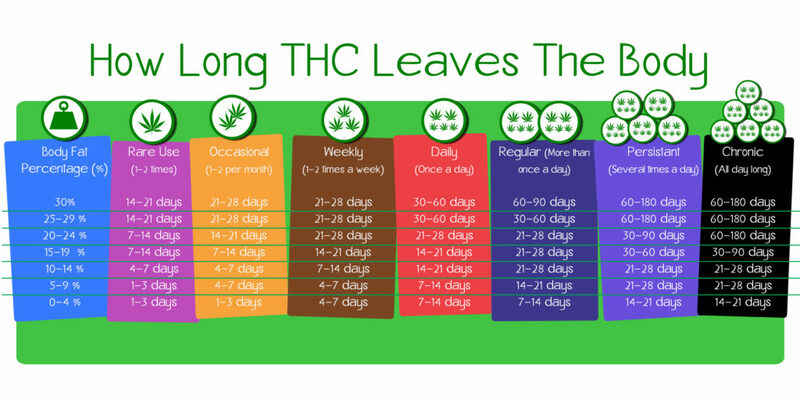 Factors affecting how long THC remains in your body are your weight and your body fat, as well as the amount of cannabis used and, as mentioned, the frequency of use. Thus, a physically fit individual will detoxify THC faster than an unhealthy person.